Combining complex science with skillfully executed prose, these edgy, award-winning tales explore the shifting border between the known and the alien. The beauty and peril of technology and the passion and penalties of conviction merge in narratives that are by turns dark, satiric, and introspective. Among these bold story lines: a seemingly humanized monster from John Carpenter’s The Thing reveals the true villains in an Antarctic showdown; an artificial intelligence shields a biologically enhanced prodigy from her overwhelmed parents; a deep-sea diver discovers her true nature lies not within the confines of her mission but in the depths of her psyche; a court psychologist analyzes a psychotic graduate student who has learned to reprogram reality itself; and a father tries to hold his broken family together in the wake of an ongoing assault by sentient rainstorms. Gorgeously saturnine and exceptionally powerful, these collected fictions are both intensely thought-provoking and impossible to forget. 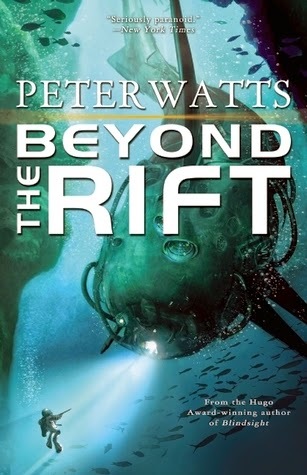 Beyond the Rift is a collection of 13 hard SF short stories by Peter Watts. These stories have all been published previously in other publications. The first two stories in the anthology, The Things and The Island, were nominated for several awards including the Hugo, the Locus, and the Theodore Sturgeon Memorial Award. Please note that The Niche refers to a history of abuse and potential consequences of that abuse. I have been slowly working my way through the Sword & Laser book club picks. Last year, I read Blindsight by Peter Watts. Normally, I do not read "hard" science fiction, so I was excited to give Blindsight a try. At times the book was a bit hard to read (I had to read the ending twice, because I didn't understand what happened the first time around), but I was glad that I read it. When I saw this book and noticed that one of the stories involved a psychologist, I knew I had to give it a read. Like Blindsight, I had a hard time reading Beyond the Rift at times. The "hard" SF bogged me down at times, and I found myself skimming sections. This science really wasn't that hard or confusing; it just isn't the best fit for me. For those who are interesting in trying hard SF, Beyond the Rift is a great book. With an anthology, you aren't committed to any one story, so if one of the stories isn't your cup of tea, you can try another story and see if the hard SF in that story works better for you. Watts does a great job of balancing science and fiction. There is enough science to make the story plausible and enough fiction to make the story fantastical. Although the science bogged me down at times, the story lines kept me reading. I should warn you that Watts doesn't write cuddly stories about rainbows and puppies. One critic, James Nicoll, has been quoted as saying "Whenever I find my will to live becoming too strong, I read Peter Watts." Although Watts' stories rarely end on a positive note, they are quite inviting in a dark way. Many of the protagonists in Watts' stories are humans who have been modified in one way or another (both physically and mentally). Watts uses these transformations to play with our conceptualization of what it means to be a human and to be alive. The stories are most definitely haunting. Overall, I enjoyed this collection of stories. I found them to be fascinating and dark. These stories are perfect for the hard SF fan. I give this anthology a 3 out of 5.